Lady Maisery – Rowan Rheingans, Hannah James, and Hazel Askew – give an intimate and informal ‘unplugged’ evening concert as part of their Singing Weekend at Halsway Manor. Underpinning every performance are Lady Maisery’s distinctive harmonies: sometimes lush and rich, sometimes dark and invigorating, they intertwine with assured precision. 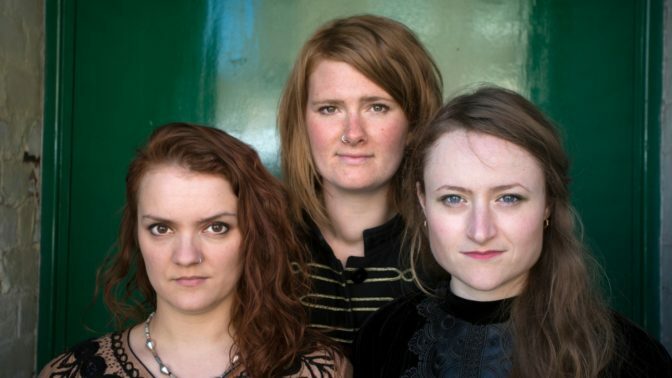 The trio also breaks new ground as one of the first UK groups to explore the tradition of ‘diddling’ or mouth music, which has nearly died out in England, but is still prevalent in Scandinavia and other parts of Europe.